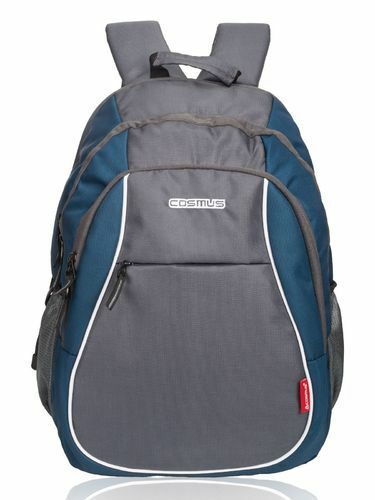 Cosmus Zion durable high quality travel backpack is ideal for one or two days trip. Carry your world along with you on this spacious backpack. Its 3 big compartment has enough space to accommodate all your belongings for a short weekend trip. Well padded shoulder strap & thick padding on the back ease the burden of a full bag. Â It has 3 compartments, which includes one detailed organizer compartment having Â inside zipper pocket & many organizer sections. It also has 1 front easy access zipper pocket to keep pens headphone etc & 2 mesh side pockets to carry water bottle and other easy access items. Bottle Lock attached to one of the side pocket protects your bottle from falling down in crowded places and while on riding bike. Our Strength: We use high quality fabric and heavy duty nylon thread for stitching to give the bag long lasting life. With over 10 years experience in bag manufacturing, you can rely on our craftsmanship & Â quality. We ensure QC in every stage of manufacturing to ensure best quality bag for our customers. Easy Return Policy: For any reason if you don't like the bag, we offer 15 days "No Question Asked" refund policy. We accept return only in unused condition and with all original tag and accessories (if any).